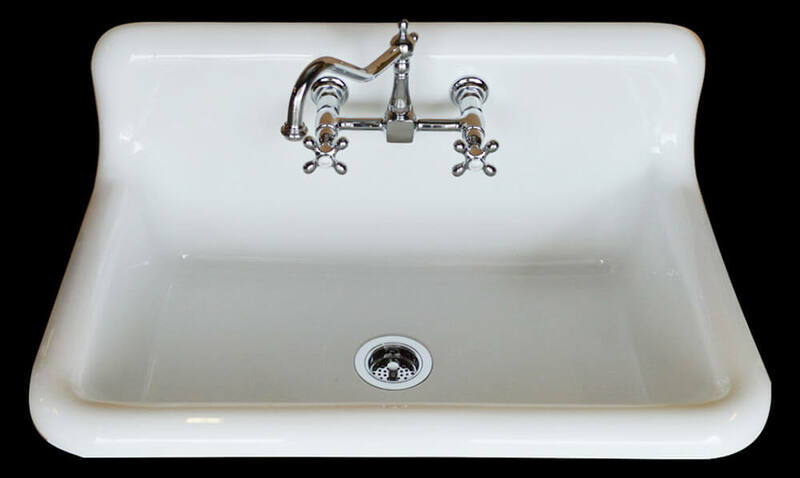 Home » Kitchen Help Category » Robert wants our help: Who made his vintage drainboard sink? 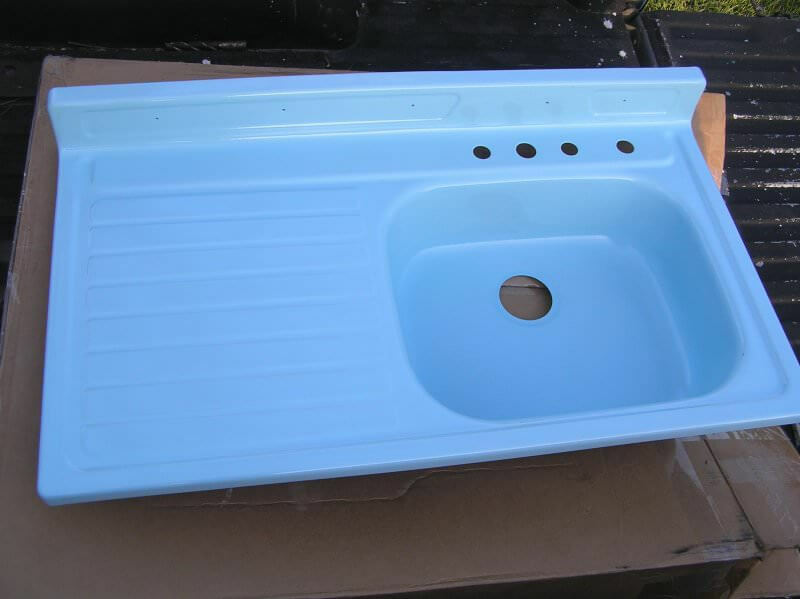 Robert wants our help: Who made his vintage drainboard sink? Who manufactured Robert’s drainboard sink? 10 years of blogging, and I am stymied. I’ve never seen holes in the backsplash of a drainboard sink — holes presumably used for anchors for inserts and a … logo? Can anyone figure this out? 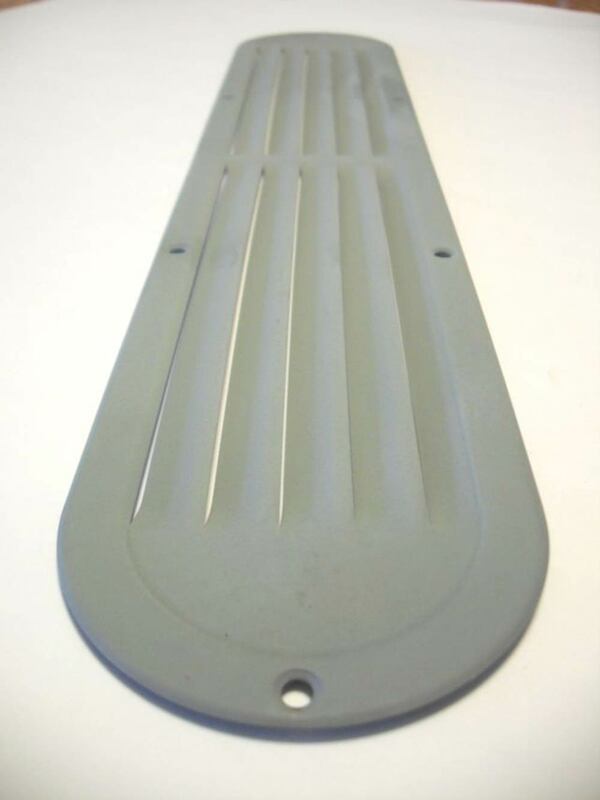 Hi Pam, do you know the maker of my drainboard sink? I just had it re-porcelained in sky blue to match my Chambers stove, but there are two decorative panels on the backsplash that are missing and I’d like to find a picture of what they might have looked like so I can fabricate something to take their place. There’s also a hole for what I am guessing was the original badge/emblem, but it’s missing too. Any guesses? Thanks. I asked a few more questions. Where did you get the sink? And, is it possible that someone drilled into the backplash at some point to cover it with another material? The holes look too uniform. I’m a pretty fair fabricator, and they look stamped in, and not drilled, so I’m thinking they are original. But I might be wrong. Hmmm. I looked in my archives and online for a while to try and find the answer. 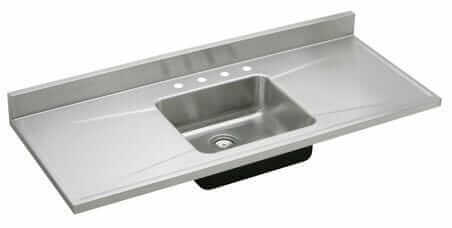 Youngstown made sinks with molded recesses on the backsplash like the ones seen in your sink. But, I can find, and can’t recall ever seeing one, or any other brand, with decorative inserts. 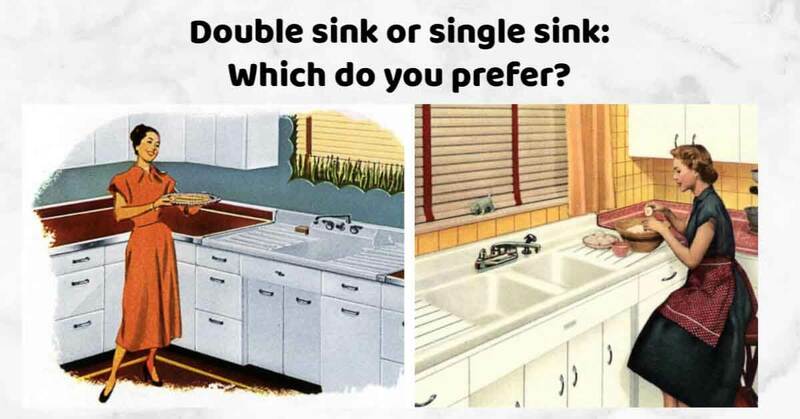 Double sink or single sink in the kitchen? Which is better? Some seemingly factual replies and some good, but also questionable guesses or thoughts. As someone who deals with a lot of vintage sinks, I have not yet seen the small holes in the back splash. As a retired Tool & Die Machinist and someone who pays attention to detail, I have some offerings. I believe the theory or fact of an applique with company name, say in the long recess on the left or similar to the small recess on the right. However, on my PC It appears that there is another hole in the forefront between the two recesses. So it would need to be for a third applique Which is possibly for some little emblem. If you want to know if holes were punched one person offered accurate explanation about chipped finish etc. Another way to tell if holes were punched is the holes will have a radius on edges of the entry point of the punch and will appear to have more squared off edges at the exit point. Manufacturing practices dictate that all holes will be punched from the front of the sinks back splash surface. Depending on how often they sharpened the punch and die for the holes will effect how smooth the finish is around the exit hole of the punch. Quick lesson folks, the hole punch tool you use to punch holes in sheets of paper, say for your 3 ring binder is a punch and die. One for the sink will obviously be more elaborate and much stronger etc.